From BELOW STANDARD to Top Rated Seller on eBay - In JUST 2 Weeks! From BELOW STANDARD to Top Rated Seller on eBay – In JUST 2 Weeks! Very often I receive emails from people who have had their eBay account lowered to “below standard” for various different reasons, most often due to a too high defect rate. And I’ve always said that the only way out of such situations is to go out and buy and sell loads of cheap items via auctions with free shipping, to get lots of new, defect-free transactions that allow you to improve your account status by the time the next evaluation occurs. 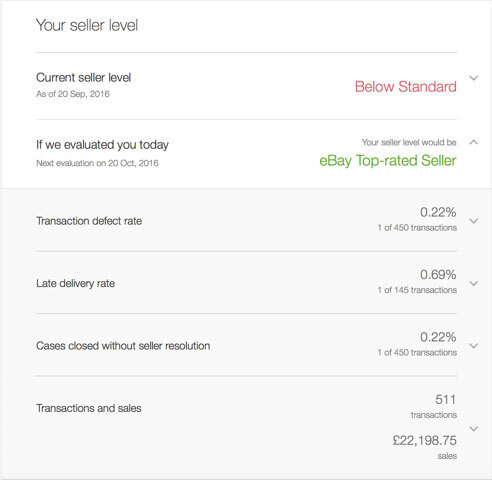 This is not always a simple task as in general, when your account goes below standard, eBay punishes your listings by giving them lower search positions which makes it even harder to get back on track. So it’s always best to start taking action on this WHEN you see in your dashboard that your account status will go to Below Standard on the next evaluation. Not after but BEFORE it happens. Because that way you can use that time to your favour and get the maximum amount of sales possible before your account status gets lowered. And today I want to share with you an incredible story of how one of my customers, Rupert, turned a below Standard account into a top rated seller account in less than 3 weeks’ time. This is truly an inspirational story to all people facing the same problem and it’s proof that anything is possible as long as you truly want it and work hard towards it! Without further ado – let’s hear the story in full detail. How I went from Below Standard to TRS status in just a few weeks’ time. I have had an eBay account since 2001 and upgraded this to a business account in 2014. My initial business was selling antiques and vintage items, of which most of my inventory came from antique auctions around the country. I already had a couple of physical retail outlets in the form of rented space in antique centres, both within an hour’s drive from my house. By the very nature of ‘used’ items, the return rate or potential for cases being opened was fairly high. And I soon learned that the probability of being scammed also increased. Quite often a watch would be purchased by an overseas buyer and kept for a few weeks before the buyer then returned the item suggesting the watch didn’t go with a wedding outfit or some other reason that was clearly not my fault as a seller. I essentially felt that I was being treated like a Next catalogue. I have 100% feedback and in order to keep it that way I would always be at the mercy of my buyers, not matter what their complaint. I have many examples of buyers asking for an enormous partial refund, anywhere from £400 to over £1,000 in most cases. These were for high priced items like vintage Rolex, Breitling watches and the like. I would always bend over knowing that not to do so would result in a negative feedback. I’m of the opinion that some buyers knew this. I listed very honestly and marked any defect clearly! The last watch I sold (and the main offending item in this article) was an antique solid gold ladies fob watch. The listing clearly stated that it did NOT function and was being sold purely on its gold weight value. The lady in Russia kept this watch for almost 1 month before opening a case and demanding a full refund on account of the watch not functioning! Having got tired of selfish and unreasonable demands I decided for the first time in my years as a seller to ignore the buyer and let eBay deal with her. My eBay account was listed in the Dashboard as being ‘Above Standard’. However over the previous 12 months of my evaluation period I had received 4 defects. All 4 defects were due to me listing items as ‘Out of Stock’. Two of the items were items that sold on eBay but were also being sold at my physical outlets. Unfortunately both items had already sold at these outlets and I had not checked my stock for almost a week! The buyers were both very understanding and fortunately did not leave any negative feedback. The other 2 defects were cases where the buyer changed their minds and I cancelled the transactions by checking the ‘Out of Stock’ option. All 4 items resulted in a defect against me. Now I had never taken any notice of my dashboard until Andrew pointed it out and I had no idea of how this affected me. When the lady in Russia opened the case against me regarding the gold fob watch I foolishly allowed eBay to resolve the problem which resulted (as always) in the buyer being fully refunded. Prior to this defect, Andrew had asked me to check my Seller dashboard and try and sell a certain amount of items in order to get my account into TRS status. However this defect tipped me over the edge and resulted in a predicted evaluation for the 20th September as being ‘Below Standard’ with a defect rate of 6.02%!! In order to qualify for TRS I would need to be under 0.5%. In fact, just to get back to ‘Above Standard’ I would now need to get my transaction defect rate below 2%. The date at this point was the 13th September. In order to get my account back into ‘above standard’ or even ‘TRS’ level for next month’s evaluation period I needed to make sufficient sales by the end of September 30th. Currently I had 83 transactions over the last 12 month period. 5 defects divided by 83 transactions over the previous 12 months gave me a 6.02% defect rate. So by my calculations I needed over 250 transactions by September 30th to bring my defect rate to under 2% (5 / 250 x 100 = 2%). However I would still have 5 defects to my name and any slight error could result in me going below standard again. This would not be good for the nerves when trying to start a new business with Andrew’s help on the 60 DBP course. 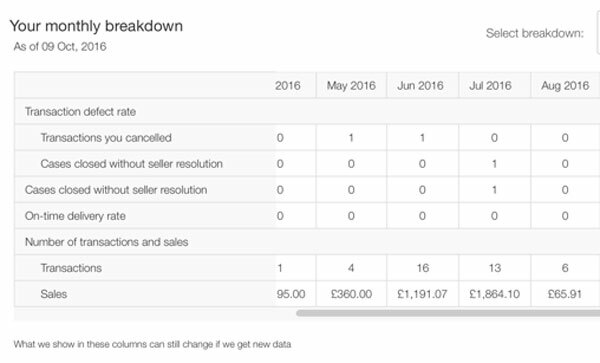 So… I read that if I can achieve 400 sales over a 3 month period I would be evaluated as a ‘high volume seller’ and as such only evaluated over a 3 month period. For the next evaluation period on the 20th October (which works 1 month in arrears) this 3 month evaluation period would run from 1st July to the 30th September 2016. If I could achieve this I would be evaluated at TRS level by 20th October 2016!! So I got to work! I had 8 days (from 13th September to 20th September) before my account fell below standard and my listings all fell further back in best match results. And I had just 18 days to make my 3 month sales quota of 400 transactions (by the 30th Sept). For July I had 13 transactions and just 6 for August. I needed 381 for September! Everything I could sell I sold! I purchased DIY items like cable clips, cable ties, telephone wire connectors (the sort used by BT or Sky engineers) and I purchased these in bulk. For example a tub of 500 telephone wire connectors would cost in excess of £60 but most people would only require a handful of pieces for a DIY project (10pcs or 20pcs). So I sold these in small batches and undercut every single supplier on eBay. In fact after postage and eBay/PayPal fees I took a loss on each sale. I also bought cable ties in batches of 500 and sold them in groups of 50-100pcs. All items I sold went for cost price and were shipped with 1st class post and my cut-off time was literally 10 mins before the post office closed for last collections at 5:15pm (at my local post office). I even added extra items to the orders so as to keep buyers extra happy as I knew one more case would finish my eBay account permanently! I had 3 incidents where buyers reported an item as not received. When this happened I immediately went over to Amazon, ordered from another supplier and paid extra for next day express delivery directly to my customer’s address (again at extra cost to me, resulting in a loss of course). Sales of these cheap items were going very well and I was well on target. That was until the 20th September when my account now officially declared me as ‘below standard’, as I knew would happen. The result was a dramatic drop in sales from a minimum of 20 sales per day (sometimes as much as 40!) to just 1 sale! All my items were 4 pages back on eBay’s best match results!! What I did was change my listing format to 3 day auctions, ensuring that every day my items would be coming to an end due to auction time running out and thus my listings would appear for a brief moment at the top of the page right at the end of the auction. All listings were started at 0.99p with no reserve and free 1st Class postage. My current stock was all listed in this way for the remaining time before the end of the month. Also pretty much anything I looked at in my house that I felt was something I no longer required was photographed on my iPhone and immediately listed on the spot, again using my iPhone and using the 3 day auction listing format. All were scheduled for 9pm end times to ensure the best possible audience for my auction closing times. The result was truly miraculous! By the end of September I had made 431 sales!! And this was from only half the month! Add that to the previous 2 months of 6 & 13 transactions for August & July, this gave me a total 3 month sales figure of 450 sales. My next transaction evaluation period would only take into account these 3 months therefore my only defect in that period was 1 item. 1 defect/450 transactions x 100 = 0.22% defect rate. I had achieved TRS level from Below Standard (with a whopping 6.02% defect rate) in less than 3 weeks! I should add that I made an overall loss for this whole period, however it was a small price to pay. I think with an account in “below standard’ status I would have no business whatsoever resulting in a complete loss of my livelihood. On top of that, eBay is very hard on substandard sellers and I could have been permanently banned/restricted from selling on eBay if this continued. A frightening prospect from someone who relies heavily on this platform to make a living! I received a call from an eBay rep based in Ireland who was so impressed that I had tuned my account around in such a short time, going from 6 sales in August to 431 sales in September, that she wanted to congratulate me and share my story with her colleagues! Boy was I chuffed. 2 different eBay reps had both said they had never seen such a turnaround! I have learnt to never neglect my dashboard again. I hadn’t realised the implications of ignoring this. Also I now know that I must NEVER list an item as ‘out of stock’ or allow eBay to resolve a case that I can resolve myself. Both of these will result in defects and are considered by eBay as being the biggest issues that will disappoint a buyer – eBay is all about the ‘Buyer Experience”. I’m not certain they have given much importance to their sellers yet as we have to bend down to the most unscrupulous of buyer and even kiss the backside of buyers that we would otherwise not give the time of day to in the street. I was scammed twice I believe during this period, one which told me she was not in receipt of her items (she purchased 2 BT modems from me in 2 separate auctions). She told me a week later they had not arrived and was very rude as well. I had proof of postage but all she wanted was her money back. I refunded her immediately yet 2 weeks later both my items were for sale on her eBay account! Many thanks goes to Rupert for sharing this story with us! It really shows what you can achieve with some hard work! Hey, I’ve been stuck on 0.34% cases closed by ebay for 6 months. I cannot get out of this hole. I have 4 transactions out of 1183 that were closed by ebay. I have very low sell volume now and no cases being opened so I cannot change this figure. The only way to get it down is to sell more items but I cannot because the items do not display in search results. Or wait 1 year for the defects to be removed. The fact that ebay removed above average from this metric has shut down my business. Last year we turned over over 100k. This year we turn over 8k YTD. But if you want to stick with eBay, why can’t you do exactly same strategy I have covered in this post? Ebays system for rating sellers is a joke. I’ve been selling on eBay for over 10 years and have always been an “above standard” seller. (10,000+ transactions, 99.5% positive). Recently my acct went below standard (due to some of ebays very strict and strange ways). I’m still at 99.5% positive. I have certain items with 200+ watchers, 75+ sold, and no defects on those specific item numbes. In the category, this is exceptional compared to what other sellers are offering for this exact item. The day my acct went below standard, all my search results went from the first visible “ best match “ option, to NEARLY THE BOTTOM OF THE SEARCH BARREL, ( 5th from last) and sales have halted. I have 3000+ items for sale, and pay about 25,000K a year to eBay in fees, yet, new Users with 0 feedback and fake photos have a better chance of selling than me right now. It’s very very insulting. I totally agree with you…. Unfortunately that’s exactly how vulnerable sellers are on eBay and reason why you simply can’t relay on eBay as your main selling platform anymore. I dropped to below standard to the exact same way as him. Without even realising how much of an impact this would have. My listing are nowhere to be found on ebay. Even if I bought a bulk load of small items and undercut people, my listing will not still apear. I have put listing up on promoted and at a very high bid for it to appeae, way abover trending rates, but still they do not appear. How do i sell if the platform does not show my listings? If I bulk buy something like zip ties or whatever just to mass sell (i’m assuming my only option now is to auction) do people even bid for these items? Yes, you need to use auctions and at very low price – £0.99 with free P&P. That’s the only way to get these listings noticed in search and get those sales in. Thanks for your reply Andrew however I have had a slight issue with this strategy. I listed 1 item, 1 to be sold at 5pm, another at 6pm, and every hour until 10pm so 6 times a day. However Ebay shows it as duplicate and I can only sell it technically once a day, is there any way you can recommend as to how I can get around this? Thanks for the tip, I followed the strategy and got over 200 sales in the last 2 weeks. I actually got to where I needed to be on July 19th a day before the accounts are assessed on the 20th of each month. I am still below standard however and showing that on the next assessment I will be above standard from Aug 20th. Reason being is apparently the transaction defect rates are calculated over a 12 month period and my last 12 months would be from 01 July 2017 to 30 June 2018, not until the 20th of July 2018, the dates they assess the account. Is there anything I can do? or do I have to wait until Aug 20th? Hope that makes sense, thanks. Just wait out another month and you will be fine then. Hi Andrew, I’m back again. I can clearly tell that the traffic has dropped dramatically compared to before I dropped to below standard. Ive spoken to Ebay multiple times, they say there are no limitations on my account and just give me generic answers. Is there anything that can be done or is my account ruined forever? give it at least few more weeks and see how situation changes by end of September. Very sorry to hear about your situation… big, BIG mistake. Cases closed without seller resolution – this number should basically be 0, at any given time. Now, if you’re on 3 month evaluation, you can expect on getting back on track only in November (as 3 months clean period will then be August, September, October). I commend you! How do we allow people to steal from us so they go up and we go down in ratings? Why doesn’t Ebay care about their sellers? Who came first? The chicken or the egg? Makes me so sad to hear your story. I am glad to hear you made it out Back On Top! But always at Our expense! Praise for honest purchasers or we would all sink. Including Ebay! It all comes down to level of competition, number of sellers for most products on eBay. There are simply so many sellers, too many sellers in eBay’s eyes – they don’t really care. Majority of sales are made from first page search results anyways, so eBay don’t care about the listing on 5th or 25th page. as you received TRS status and you are out of below standard, how long did it take you to go back to your sales volume before being below standard? We have definitely learned a lot from your blog about eCommerce specially on eBay.I really appreciate it. Now we’d like to come up with social commerce specially “Facebook Commerce”. Would be grateful if you wrote various aspects of the Tips/Tricks and Advantages. Moreover, would love to know about various online getaways Payment policies with Merchandiser and F commerce Shopper. Thanks very much for your suggestions Entine! Having read Rupert’s story, I must admit that I feel very angry towards Ebay! I have been on Ebay for a good few years now and have recently started to sell a few items again after a long lay-off. The changes that have taken place whilst I was out of the loop, are both many and – in my opinion – counter-productive! Leaving aside the obvious PayPal ‘stitch’ regarding postal charges, I feel that the way Ebay bows down to buyers and usually sides with them before doing any checking at all, is great – IF you are either a buyer or Ebay! For those of us who are 100% honest and who always try to go that extra mile, I feel Ebay is taking the p*ss! Do they REALLY think that anyone is suckered in with this ‘free-postage’ mularky? NOTHING is free – even (or especially) on the Internet! That they choose to rate sellers on their offering ‘free’ postage just goes to show how far Ebay has drifted away from its original roots. Add to the above, the way that the DSR figures are skewed ( You come top in the P&P rating IF you offer ‘free’ P&P) and the whole Ebay ‘thing’ starts to look like a big con! It’s not like eBay came up with the whole Free shipping idea. It’s what customers ask for and that’s why they did it. I know that nothing is free but from a customer buying experience, having a final price showing in search/listings is better and that’s why eBay pushes it.